GF Piping Systems will introduce the new Signet 9950 Dual Channel Transmitter and the Signet 3-0486-D Profibus Concentrator at WEFTEC 2016, Booth #4401, Sept. 24-28 at the New Orleans Morial Convention Center in New Orleans, Louisiana. Also on display will be the company's full line of piping systems and instrumentation for liquid measurement and control of flow, pH/ORP, Conductivity/Resistivity, Level, Pressure, Temperature, and Turbidity. The new Signet 9950 Dual Channel Transmitter enables two measurement readings in one transmitter. This powerful feature offers cost savings and convenience by eliminating the necessity of multiple single channel transmitters in applications that require several measurements and a local display. Advanced functions provide users the setup ease of a transmitter and the versatility of a controller. With its dual channel capability, users can connect two of the same sensor measurement types such as flow and flow, or two different types, such as pH and ORP. Additional versatility is provided with its capability for multi parameters through support of the complete line of Signet flow and analytical sensors, as well as other devices with a 4 to 20mA current loop output when using the Signet iGo module. Large backlit dot matrix display with simplified menus illuminates both measurement readings simultaneously. The 9950 also provides sophisticated features to support a variety of functions for complete flexibility. enable setting relay activation on a repeating basis in minutes and on specific days and times during the week. Also new at WEFTEC is the new Signet 3-0486-D Profibus Concentrator communication protocol. 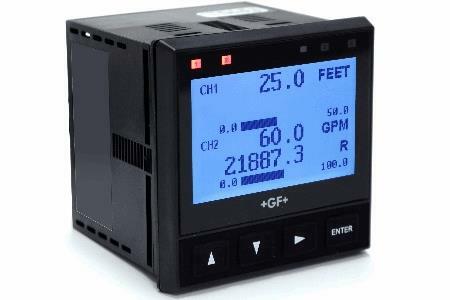 This device allows users to connect multiple GF Signet sensors, GF actuated valves and other products to their automation system, thereby reducing wires, cables, set-up time, and maintenance. The device meets UL, CSA and IEC61010 Safety approvals, has passed the EU and FCC requirements for EMI and EMC, and is certified by Profibus International. 4 to 20 mA current loop input and output channel with proportionally controlled actuated valves or other 4 to 20 mA devices. GF Piping Systems supplies a full range of plastic pipe, fittings, valves, actuators, fusion machines, secondary containment, heat exchangers, custom products, and sensors and instrumentation for industrial process control. For further information, please contact: GF Piping Systems, 9271 Jeronimo, Irvine, CA 92618-1904 USA; For more information, visit www.gfps.com.